Editor’s Note: This is a guest post by Greer Arthur, a postdoctoral researcher in NC State’s Department of Molecular Biomedical Sciences and an associate member of the university’s Comparative Medicine Institute. The Comparative Medicine Institute (CMI) at NC State is launching a drug discovery initiative to reinvigorate the hunt for powerful new drugs. The initiative, coined “Natural Products to Drugs” (NP2D), will accelerate the identification of naturally-occurring compounds with therapeutic potential, ultimately leading to the development of new medicines targeting infectious diseases, inflammation, allergies and pain management. NP2D was developed as a joint effort between the CMI and the Department of Chemistry in the College of Sciences at NC State. The initiative symbolizes the mission of the CMI, which is to develop multidisciplinary teams focused on translating basic scientific research into clinical and societal applications, with the overall goal of improving animal and human health. 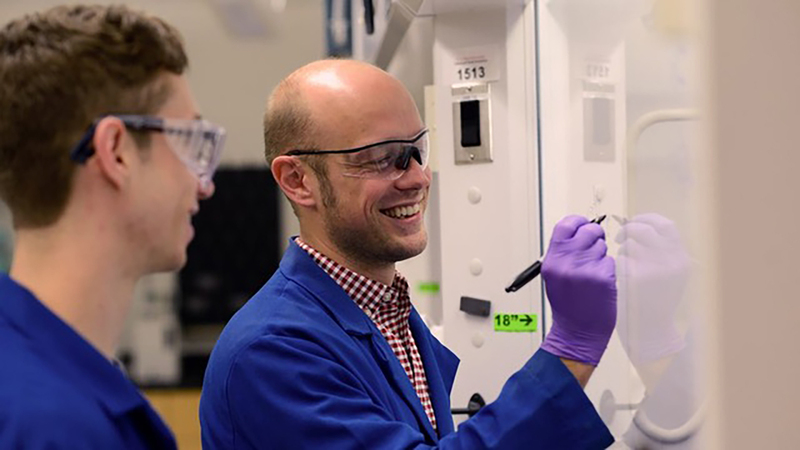 “The idea behind this initiative is to find new molecular entities that show great promise, activity and safety profiles, and increase the translational potential of natural products research into leads for new medicines,” says Joshua Pierce, an assistant professor of chemistry and leader of NP2D. North Carolina is rich in both natural resources and expertise in natural products drug discovery, and with recognized leaders in the fields of infectious disease, inflammation, allergy and pain, NC State’s CMI has a unique opportunity to apply innovative academic research to address the urgent need for new therapeutic approaches in these areas. NP2D is an expansion of ongoing efforts in drug discovery research by both the EID and another division of the CMI, Translational Pharmacology and Physiology (TPP). The consolidation of these efforts in an independent initiative will allow faculty from the CMI to lead a focused investigation in small molecule drug discovery for multiple therapeutic applications. A key goal of NP2D is to create collaborative projects between synthetic chemistry, biological sciences and veterinary medicine, which will enable the evaluation of currently unexplored small molecule natural products from plant and marine-based sources. The initiative will also allow the CMI to foster new partnerships between academia and industry, and utilize the individual strengths that each possess to expedite the early stages of small molecule drug discovery. “Under the CMI, this initiative will provide private and federal funding opportunities as well as commercialization efforts for projects that are currently siloed in either individual labs or different institutions,” says Pierce. One early example is a collaborative effort between NC State and UNC Wilmington’s Center for Marine Biotechnology to identify novel natural products for development as antibiotics against ESKAPE pathogens – a group of bacteria responsible for life-threatening infections contracted in hospitals that are often resistant to antimicrobial treatments. Pierce says this effort is a direct result of the CMI and looks forward to starting similar projects across NC State and North Carolina. Importantly, NP2D will tackle not only the unmet need of new therapeutics for infectious disease, inflammation, allergy and pain, but also create a hub for interdisciplinary training for the future generation of scientists.